Lately I’ve been reading a few articles posted on the web from people questioning just how committed the Amazon Kindle Singles store is to independent authors. True, if you look at the list of best sellers, it’s dominated by some very heavy hitters. But, they also keep an eye out for new voices, and I’m testament to that. 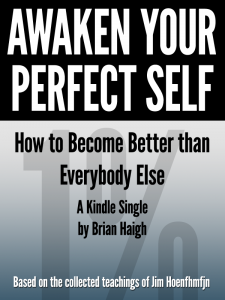 A little over a year ago, my first-ever ebook, Awaken Your Perfect Self: How to Become Better Than Everybody Else, was selected to be a part of the Kindle Singles store. It was May 2012, and I had just completed my first short book and published it to Amazon.com. At the same time, I decided to try to submit it to the Kindle Singles store, knowing that the odds of being selected were mathematically very slim. However, about three days later, I received an email telling me that they wanted to add it, and sure enough, by the end of that week it was live. At the time, David Blum, the editor of the Kindle Singles store, told me that it would be a big deal, a life-changing kind of thing, and he was right on the money about that. The book ended up selling over 10,000 copies, and peaked just inside the Top 100 bestseller list for Kindle ebooks. For a first-time published author, it could not have been a better experience. I had to pinch myself more times than I could count (especially when it surpassed Stephen King on the best-seller list!) in the months after it was published. Let me just say, getting into the Kindle Singles store is hard, not just for an independent author, but for any author, and as it has grown in popularity it’s only getting harder. My followup book, The Road to Hell is Paved with Kitty Litter, wasn’t accepted this time around. And granted, they may even be growing so fast that they’re now struggling to keep up with submissions. After submitting The Road to Hell is Paved with Kitty Litter, I followed up with an email that referenced my first book (the one that’s in the Kindle Singles store and has sold over 10,000 copies!) only to get a form rejection letter a few weeks later for that book – so it’s true they must be having trouble keeping up with the growth curve. Nonetheless, any independent writer out there should consider the Amazon Kindle Singles store. It’s tough to get accepted (and getting tougher all the time), but they’re definitely looking for new voices. I’m really thrilled to be announcing that my new ebook The Road to Hell is Paved with Kitty Litter is now for sale on Amazon. I wrote this novella with summer in mind – a short, breezy, fun read and I hope you all enjoy it. The followup to Awaken Your Perfect Self: How to Become Better than Everybody Else teams the recently-paroled narrator from the first book with ace cat detective Sam Touba as they hunt high and low for the elusive self-perfection “guru” Jim Hoenfhmfjn. 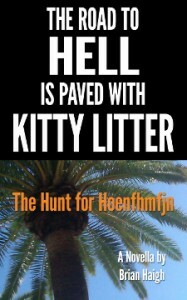 Part road trip, part detective send-up, The Road to Hell is Paved with Kitty Litter is an absurdist journey that begins behind a dumpster in a seedy Los Angeles parking lot and finds its way to Las Vegas, with several cats and Hoenfhmfjn “life lessons” sprinkled in between. Based on a series of interviews with self-perfection guru Jim Hoenfhmfjn (pronounced “Hinfmfn”), this short story introduces the reader to Jim’s philosophies in 15 easy-to-digest life lessons. Learn how to put yourself before others, take instead of give, and stop being a follower and become a leader. Propel your life forward and achieve ultimate success – start perfecting yourself today!